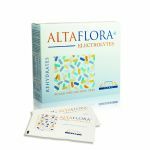 For the above-mentioned reasons Alta Care Laboratoires has felt the need to create the supplement Altaflora Electrolytes. It is a product made up of monodose sachets containing both electrolytes and probiotics. Currently, there is factual evidence to prove that probiotics - the "friendly" bacteria - are of actual help in strengthening the immune system and preventing the emergence of several modern diseases. The beneficial bacteria in the intestine, that is those that destroy the complex sugars and that we could take through Altaflora Electrolytes, are beneficial because they lower the risk of such important colon problems, strengthening it internally with a sort of shield against the reduction of our important bacterial flora. Probiotics, as we have said, are able to induce a functional improvement in the intestine and in the metabolism of the colon, helping the digestive processes and producing some vitamins such as vitamin B12 and K.
The probiotics, bifidobacteria, and lactobacilli in particular, present in the composition of the product Altaflora Electrolytes, act to prevent the break-up of the bacterial microflora that leads to the proliferation of pathogens in the intestine. Such micro-organisms are especially dangerous since they are potentially able to colonize other areas of the body, causing, for example, infections - vaginal, respiratory and even dental. Taking a tablespoon of Altaflora Electrolytes will certainly be a wise thing to do for it strengthens our immune system and give us a greater sense of well-being. For further information contact Alta Care Laboratoires - 06-69380852, Piazza di Spagna, 6, 00187 Roma.